Playing games on PC is absolutely fun and thrilling. But, long hours of continuously staring the screen can be harmful to your eyes. And, protecting your eyes is much more important than shooting those enemies. So, today I am sharing the list of best gaming glasses that you can buy in 2019. Also, you will find some great discounted deals on gaming goggles available in the market. If you have played those long missions of war games or that one level which took infinite attempts to clear, then you must have experienced the tiring strain on your eyes. Well, I can bet every one of us has been there. But on a serious note, we must not ignore it because it may worsen and cause critical eye issues. So, what should you do? Replace your monitor or rush to your doctor? Or simply play with your eyes closed? (lol, no one is such a pro 😛 ). The common solution is to take regular breaks but it gets too late before you realize it’s hurting your eyes. Also, changing your monitor is not going to help because the problem is not the monitor but the exposure to blue light. And, the screen needs to emit lights (especially blue light) to display images and videos. This blue light has harmful effects on your eyes that should be avoided. All You need is a pair of gaming glasses that serve the purpose without burning a hole in your pockets. I did the complete research and have listed the best gaming glasses and ultimate buyer’s guide for you. Here’s the list of best gaming glasses available in 2019 along with their detailed reviews. Back in 2007, Gunnar was actually the first one to introduce the glasses for gaming and they are known for their quality. 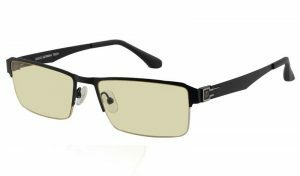 The gaming glasses variant which is on top of this list is Gunnar Optiks PHA 00101. This pair of gaming glasses features the patented amber lens from Gunnar which will protect your eyes from extensive blue light and glare. In addition to that Gunnar Optiks PHA 00101 has a UV coating to stop ultraviolet light from entering your eyes. They are built ergonomically keeping in mind the comfort while wearing. The full-rim frame has 132mm temples and made up of high-tensile steel with highly durable hinges. The durability is coupled with an eye-catching design which you can even prefer to wear anywhere around. 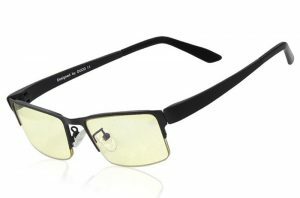 Gunnar Optiks PHA 00101 gaming glasses weigh just 25 grams; light enough for strain-free gaming for long hours. The nose pads are made of silicon and can be adjusted very easily to the closest fit. Though they fall in the mid-range glasses, Gunnar Optiks PHA 00101 is a pair of gaming glasses that is definitely our must-have recommendation to all the PC gamers, especially, the professional gamers. The second entrant on our list of best glasses for gaming is NoScope ‘Wraith’ Video Gaming Glasses. If you think putting around $50 is not worth a pair of gaming glasses, then NoScope gives you a great option at half of the cost. Yeah, you read it right! Talking about the lenses, they are coated with gaming grade resins and cut down a major amount of blue light reducing digital strain on your eyes while gaming. The lightweight polycarbonate frame is sturdy and there is a rubber padding for the nose as well as the temples. Another thing that deserves a mention is that NoScope has made this pair of gaming glasses after taking a lot of feedback from their customers who used their glasses. And after implementing all the required changes, NoScope launched ‘Wraith’, it means you can expect complete user satisfaction. With low cost, good design and comfortable build, NoScope Wraith Glasses are one of the best budget gaming glasses without a doubt! The third one of the list is another gaming eyewear from Gunnar, the leader in gaming glasses section. It is the Gunnar Intercept INT00101. 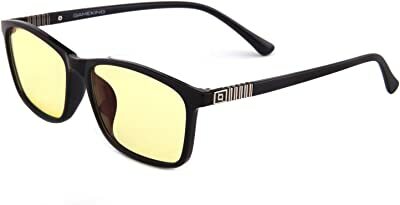 Gunnar has put in almost everything they had in store to make these glasses for gamers including the great design, ultimate eye protection, comfort and durability. Build along the lines of modern wayfarers, Gunnar Intercept is one very stylish gaming accessory. In fact, we went on to wear them in public and people barely noticed that they are meant for gaming. The best part in Gunnar gaming glasses are the lenses. You will get Gunnar’s patented lens technology in this pair too. They can block 65% of the blue light and 100% of Ultraviolet rays that come from the monitors and screens. The lenses are provided with a hard coat that prevents accidental scratches and ensures longer lens life. For a better viewing experience, Gunnar Intercept INT00101 lenses have 0.20 mag that means whatever you see through these gaming lenses, it will be a little magnified. Speaking with personal experience, it comes handy while targeting distant enemies in Call of Duty! The frame is quite comfortable having a rubbery feel to it. It has a wide bridge and crafted in such a way that it reduces air current around eyes. That definitely helps in avoiding dry eyes and irritation. With all these features, you might wonder why this one is not on top. Well, because with great features comes a higher cost. Gunnar Intercept INT00101 will cost you more than $50 and believe me it is totally worth it. In case, you are gamer who wears prescription glasses, Duco Optiks 8954L gaming glasses are the best option. Let me tell you why. It can be a heavy task to get gaming eyewear being a gamer with regular glasses. You might have to contact the manufacturer and request them to make a custom pair as per your prescription or find a retailer who might replace those lenses for you. But with Duco Optiks 8954L, you can cut all the chase and just wear them over your prescription glasses. Did you say would that be comfortable at all? Well, Duco has designed this pair of gaming glasses keeping in mind the comfort and functioning when paired with regular glasses. They are so lightweight that you won’t even feel them after putting them on. The frame is made of TR90, which ensure lesser weight, maximum flexibility and durability. In fact, they float on water and you can bend the frame to 90 degrees without any damage. Talking about the lenses, Duco Optiks 8954L has amber tint lenses to block blue light and made with ultra-pure material to provide better & clearer vision. The lenses also have a special anti-glare coating that helps in reducing digital eye strain. In case you are wondering about the price, it comes at an affordable price under $30. Isn’t that awesome? Well, you can thank us in comments! On the fifth place on our list of best gaming glasses comes Gameking Value Classic blue light blocking glasses. If you are on a budget, then you definitely should check these out. Gameking Value Classic is a sleek pair of gaming glasses that have the ability to block 60% of the harmful blue light and 100% of the Ultra Violet light. The lenses also have an AR coating and barely noticeable tint that eliminate glare and improve contrast. Also, the lenses are FDA approved as shock/drop proof and an additional coating is present to make them scratch-resistant. Just like the Duco Optiks 8954L, the frame of Gameking Value Classic is made of TR90 material making it super lightweight, flexible and fairly durable. All this comes at an extremely affordable price of almost $20 which will surely not burn a hole in your pockets. This is pair the best budget gaming glasses you can buy in 2019. Well, this one is different from all the gaming glasses on this list. 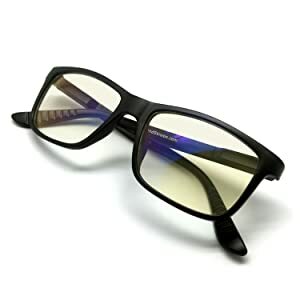 Gameking Classic Flip-up glasses for gaming are actually an extension for any of your current glasses whether they are prescription ones or just regular plain glasses. The reason to include these in our list is that they are quite versatile, cheap and easy to carry around. The lenses are capable of stopping 85% of the blue light and totally blocking the UV400 light. Another plus point is that they are scratch resistant and also repels fog, oil & stains. Because there is no frame, these gaming glasses weigh just 12g which is significantly lesser than others. Although, you need to add the weight of the glasses on which you are going to clip them. Overall, Gameking Classics Flip Up glasses are a good option if you prefer to wear your own choice of glasses even your prescription glasses too. If you’re not much into style and boasting the fashion, then you can save a few bucks on this pair of gaming googles – Duco Optiks GX090. This simple pair of glasses have almost all the features that you will get in any of the competition in this list except the design. Duco Optiks GX090 has a very plain design but don’t be fooled by that. It boasts of anti-glare, anti-oil, amber tint lenses made of ultrapure material making the eyes free from digital strain and ensuring sharp & clearer vision. They surely gonna help you while gaming. The frame is just 20g in weight and has 133mm temples that are properly balanced to reduce strain on head and face. It is simple enough that allows them to be used by males as well as females. Also, the company claims that they won’t get in the way while wearing your gaming earbuds. HyperX is a name that you must have heard if you have ever bought any gaming accessory like headsets or mouse etc. Well, not many know that HyperX also made a pair of gaming glasses – HyperX Gaming Eyewear. These gaming games are quite stylish, in fact, the most stylish on this list. The lenses are made up with crystal clear impact-resistant MR-8 material that reduces the damaging blue light entering in your eyes and ensures minimum color distortion. You will also get UV protection, anti-glare coating and an anti-reflective coating that repels oil, water and dust. HyperX Gaming eyewear has a polycarbonate frame colored into a dual tone. The temples are specially designed to pair with the gaming headsets so that you do not feel any extra pressure. You will also get a hardshell case with this pair of glasses for gamers to protect them from external wear and tear during transport. The only two negative points about HyperX gaming eyewear are the price and the lack of variants. It is costly and there is only one variant which is shown in the image above. After going through all the gaming goggles listed above, you must have understood the fact that Gunnar is the brand that delivers a lot of options for gaming glasses to choose. Gunnar Optiks Micron is one such option if you don’t want to pay few extra dollars to get a pair of designer gaming glasses. It is from the Gunnar 24K collection and comes with all the necessary features that are found in good gaming glasses. Fitted with patented lenses, Gunnar Micron blocks 65% of blue light and totally blocks UV light artificially emitted by screens. To make them look exquisite, the tint on the lenses is decreased a little and you cannot easily notice that. You will also get an amber lens contrast and anti-reflective coating. The frame of Gunnar Micron is pretty much lightweight, durable and comfortable that fits very well with your face and head. The design is so good that you can use them as regular wayfarers or even sunglasses on the outdoors. One more pair from Duco has made it to our list of best gaming glasses i.e. Duco 302 Advanced Gaming Glasses. Well, to be very frank these are one of the old school gaming glasses with not much to say about the design. But it is no less as far as the features are concerned. Duco 302 is equipped with the trademark Duco lenses. Ultrapure material is used to make these lenses and additional anti-glare coatings are present for better vision. Unlike other glasses on the list, Duco 302 comes with an ultralight stainless steel frame that is RX compatible. It means you can replace the lenses with your prescription lenses in this frame itself. The frame is also bendable and shatterproof. When you buy a Duco 302 gaming glasses, you will get a lot of extra goodies like a hard case, carrying bag, a mini screwdriver and a cleaning cloth. If you have still not found the gaming glasses that fit your budget, then you cannot get anything better than Trust Optics FeatherView. It is actually going to cost you less than just $10 and still protect your eyes from the blue light and UV. 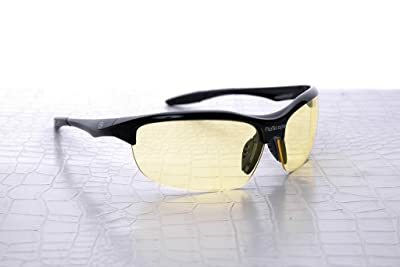 Trust Optics FeatherView uses the amber tinted lens to reduce the amount of blue light and UV rays entering your eyes while you are continuously destroying the enemy bases in your favorite game. In various tests, it is observed to have blocked almost 40% of the blue light. You will also get a TR90 completely flexible frame which is quite rare at this price. Because of the special frame, these gaming glasses are very much lightweight. Along with these pair of gaming glasses, you will get complete 2-year warranty claims on frame/lens breakage and a free carrying case too. Well, J+S Vision is not very much known manufacturer but this product actually deserves a place in our list of glass for gamers. Though J+S Vision Blue Light Gaming Glasses have nothing which we can call very extraordinary, they provide fair protection at an affordable price. The frame has three variants – rectangular, circular and wayfarer. Though, it not the most comfortable frame but the hinges are spring loaded so it can fit any head size. The company focused on providing the best possible blue light lens with zero magnification and lesser color distortion. 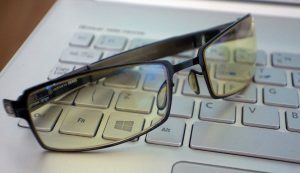 J+S Vision gaming glasses filter out as high as 90% of the high energy blue light that harms more. While it lets through close to 70% of the low energy blue light which is essential to let you see the picture intact. Though, this approach has it’s pros and cons because ultimately you are exposed to blue light. So, it is not recommended for heavy gamers but yeah you can give them a try if you are an occasional player. The last one of our list of glasses for gamers is NoScope Golem gaming glasses. Earlier in this article, we talked about Duco 8954L glasses. NoScope Golem is actually a cheaper competitor of the same. It is also aimed at those who wear prescription lenses already. The polycarbonate lenses used in this pair of gaming goggles have a visible yellow tint that blocks the blue light and UV rays. Also, they are coated with gaming grade resin which makes them more effective and scratch resistant. The universal fit frame is also made up of Polycarbonate which makes it lighter to wear along with the prescription glasses. They are comfortable over the temples and nose too. Also, the frame is tough enough to bear the basic wear and tear. The only problem is that the lenses are prone to scratches and smudges making it hard to keep clean. If you are not a messy guy (which is very rare) then head on to buy these and save some bucks over your prescription glasses. So, you have read the individual reviews of all the gaming glasses along with their pros and cons. Now, you need to decide what pair of gaming glasses is going to help you the best while you play those extended gaming marathons or eSports tournament. A good pair of gaming glasses filters the harmful blue light as well as the glare. Also, sometimes the fishy refresh rate of some monitors can also harm eyes as they continuously work towards adjusting to it. Wearing gaming glasses protect the regular gamers as well as the professional gamers from all this and definitely add up few hours to those ultimate gaming marathons. Do You Need Gaming Glasses? 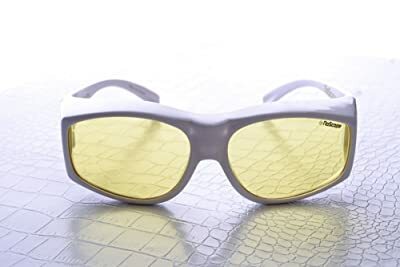 You must have seen most pro gamers at eSports events wearing those yellow tinted glasses. But it’s not only them who need gaming glasses. Every gamer who is playing games for more than 4-5 hours a day must use gaming glasses in order to prevent excessive blue light exposure. In case, you are thinking that you don’t need them because you don’t play games for extended sessions, You’re wrong. Even playing for a couple of hours daily is going to add up and eventually affect your eye health. So, you know what I mean. Blue Light is an important part of the visible spectrum and the exposure to blue light has a direct effect on the circadian rhythm and natural sleep cycle of the body. Being exposed to blue light for long period can alter the sleep cycle resulting in sleeplessness and insomnia. It is proven that blue light can also have adverse effects on our eye health. Most LCD and LED screens including monitors, displays etc. essentially emit blue light. Continuous exposure to these screens such as long gaming sessions imposes the risk of sleeplessness, eye strain and eventually having adverse effects on our bodies. That’s why it is suggested to reduce this exposure whenever possible or use tinted gaming eyewear to prevent excessive blue light entering the eyes while gaming. For that, you need to understand what makes a pair of glasses the best gaming glasses for gamers. So, let me guide you. Before buying a set of gaming glasses, you must look for the following things. Lenses: Well, we do not need to tell you that lenses are the most important part of the gaming glasses. The better the lenses, the better the protection. The main function of the lenses is to block the blue light but the amount of blocked light matters a lot. Because more blue light being blocked will end up in distorted picture and poor contrast. Typically, a good lens must stop 60% of the blue light and maximum possible protection against UV rays. Ergonomics: The comfort of wearing gaming glasses is very much dependent on the quality of the frame, the size of the bridge, temples etc. This is called ergonomics. You need to make sure that gaming glasses you are wearing are of appropriate size according to the size of your head, face and nose. It can be very difficult to play while wearing the wrong glasses. Weight: Another important factor that separates ordinary gaming glasses from the best gaming glasses is ‘weight’. If the glasses are heavier, you won’t be able to play with such a weight. The lesser the weight, more inconvenience for the user. Durability: Well, a good pair of glasses for gamers will cost you anywhere between $20 – $50. Would you want that they just break down within 3-4 months? No, right? Well, in that case, you need to make sure they are sturdy enough to go through all the wear and tear. Also, if there is an extra hard case along with it, that is a plus. So, after reading our complete guide to buying gaming glasses, you must have understood the benefits of the variety of gaming goggles available in the market. Before I end the topic, I would like to share a few of my thoughts about gaming glasses. We have seen a lot of people debating the effectiveness of the gaming glasses. As far as I have experienced, there is a clear difference in the eye strain and sleep quality. And it is logical to prevent eyes from being harmed. So, in my opinion, buying a set of good gaming glasses is going to help you in long run! After all the research, we found Gunnar Optix PHA00101 is the best overall gaming glasses while Gameking Value Classics is the best budget gaming glasses. And for those who use prescription lenses, go ahead and buy a set of Duco Optics 8954L gaming glasses. So guys, that was all. I would like to hear your thoughts about the use of gaming glasses and our buyer’s guide. Dont forget to comment below sharing the same. Also, share your experience of playing with and without gaming glasses. Loved this post? Rate it! very informative article. it will help me to buy best glasses. thanks for writing this article.